Projecting luxury without being old fashioned. FutureBrand came to us as they were working with Cadillac to reinvigorate the iconic car maker. They wanted to broaden appeal with the younger, affluent consumers driving growth in the premium automobile category and re-align their brand with modern luxury. 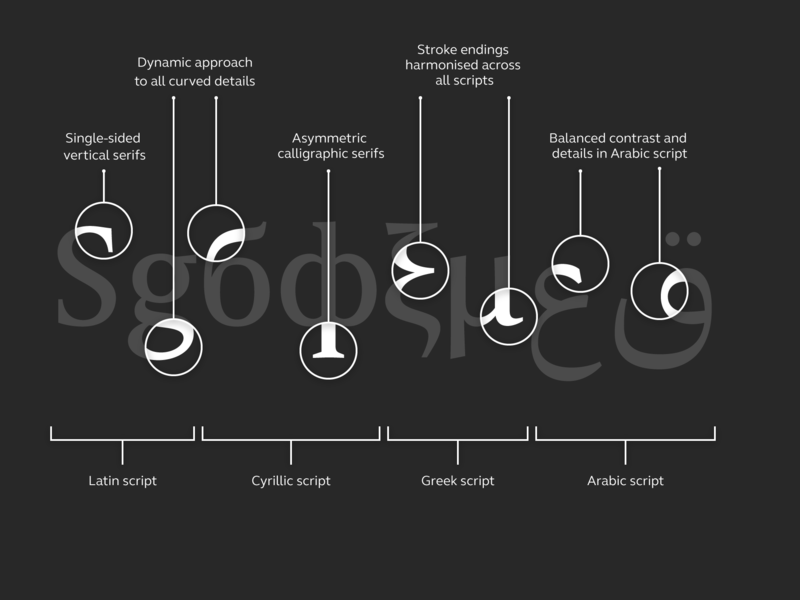 They needed a brand typeface to mirror the revitalised image for international use in Latin, Greek, Cyrillic and Arabic. FS Sally was the perfect choice for Cadillac. A very balanced typeface with plenty of character, it projects luxury without being old-fashioned. The letterforms were designed with a cornered serif on the left hand side and a curved serif on the inside and the far right which gives the same shape as handwritten calligraphy. The characterful lower case ‘a’ and ‘g’ and distinctive lower case italic ‘y’ all help to give the typeface an edge and make it unique. FS Sally was already available in Latin so our design team got to work on the Greek, Cyrillic and Arabic versions which cover over 180 different languages. By drawing on their detailed knowledge of international alphabets they worked together to ensure optical size, weight and rhythm were consistent. The font was renamed Cadillac Serif under a Brandfont® licence which means the client is able to use it however they like without any additional fees or charges. Fontsmith provided webfonts, desktop fonts and an Office suite which now sit in their Online Brand Centre for employees and suppliers to use worldwide. The Cadillac Serif typeface supports the revitalised brand perfectly and the development of the font in Greek, Cyrillic and Arabic helps them to achieve global brand consistency.